Have you ever found yourself too busy or distracted while driving to conduct a routine blind spot check upon merging lanes? If so, the GMC Terrain is the vehicle for you with its new optional active crash-avoidance system. That way, rather than just simply looking and paying attention, you can rely on the car to do it for you with its high-resolution digital camera mounted just in front of the rearview mirror that detects vehicle shapes and lane markings. Since the system is camera-based, rather than radar-based, it bases its calculations every 14 frames per second. The camera must also be unobstructed from things like mud and snow. 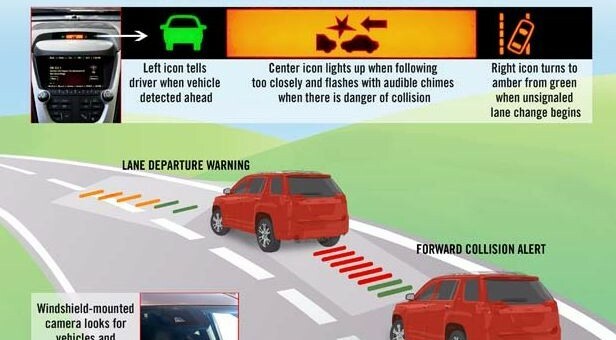 The new crash-avoidance system utilizes audible warning signals combined with a display mounted above the center console to inform the driver that they are departing a lane without signaling first, following another vehicle too closely, or if a collision appears imminent. If the latter is true, a red light flashes, your radio shuts off and it’s really up to you what happens next. The system will run for $295, or roughly the price of enrolling in a cut-rate driving education program. The 2012 Chevrolet Equinox offers the same feature as well. And having used it, we have to say that it’s best when the audible functions are disabled. Stay tuned for more on that later. so wait is the audible warning really annoying? Vic, it’s beeping awful. Pun intended. Granted I tried to set it off on purpose a few times, but the feature is not something I would ever want or need in a vehicle. It’s another precautionary system that attempts to compensate for a negligent driver, rather than the driver learning a thing or two about driving. but then I think they should also bring the BLIS to this car though. I’ve tested a couple cars with LDW and you definitely want the audible beeps turned OFF. The systems I tested were always on. Whether or not you were going to change lanes, the little icons in your side mirrors lit up to warn you there was a car (or something) in the other lane. If the sound was on, it would be a constant annoyance. However, I found the little lights useful, particularly if the car itself had significant blind spots. I still did the manual check. I understand that some of these systems work ONLY if you turn on the turn signals. Since most drivers (at least the ones around LA) haven’t found the turn signal stalk yet, it’s a good thing most systems work autonomously. The forward warning system GM is using for this application sounds annoying and I’m not sure it will be enough to get people to hit the brakes in time while they’re texting or reading emails. The more complex systems used by Volvo, Mercedes, etc. actually apply the brakes for you – that way you don’t have to worry too much about driving and get back to doing other things while behind the wheel. But then the Volvo system only works on if customers drive under certain mph so that it’ll stop completely. I think it’s 10 or 5 mph. If you go greater than it wouldn’t work. I like the Terrain untill you get to the wheels, it seems that the GMC line only gets the *chunky wheels that would not look good on a Lego car. How about giving the Terrain some of the wheels that Equinox gets. Make sure you tell your customers how the Terrian’s have horrible blinds spots….very dangerous to drive. Also if one of those doors shut on a child it would kill them the way a ton. @Andrea Wow you sounded like you’re just a troll lady! I happened to have a Terrain and I’m not even sure how you drive…… maybe you haven’t even think about if you didn’t open the door wide enough THEN it would kill a child! Just an update on crash avoidance … what’s wrong with simply leaving the phone alone, get up early enough to eat breakfast before leaving for work, and oh yes don’t be like Obama and blame others for your mistakes when you make’em.